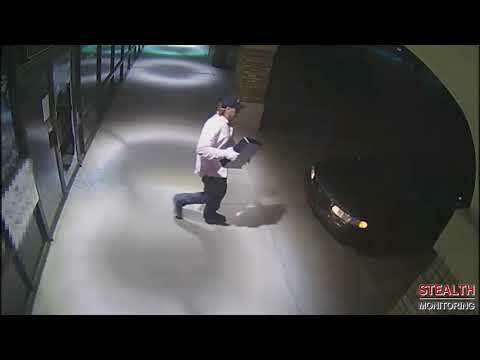 According to Plano Police Detective Jeff Dalton, the bandit first struck a dry cleaner. Using an underhanded pitch motion, he hurled a large stone into a glass pane, scurried inside and removed a cash drawer. Click the video below to see the activity. On another night the bandit tried to break into a jewelry store in Plano, Texas. He was unsuccessful in his attempt to shatter the glass, so he left the premises. Detective Dalton, who was unaware of the bandit’s previous criminal acts, contacted Stealth Monitoring for help in identifying the suspect. We not only provided surveillance video, but also camera images of the bandit and his vehicle, which was ultimately what led to his undoing. The White Glove Bandit’s criminal spree came to an end on July 5, 2018 when one of our trained operators saw him at a clients’ property. We called police, who quickly arrived to make an arrest. Our video monitoring manager contacted the Dallas and Frisco detectives to connect them with Detective Dalton. Using surveillance video, images and information we provided, the three departments determined this was the same suspect they were all looking for. Detective Dalton thanked Stealth for providing the footage and pictures, adding our help made his job and the arrest much easier. Stealth has a strong relationship with local police officers in communities across North America. When we make a call, they know our live security video is proof of a crime in progress, which elevates the priority level and increases the likelihood they can make an arrest while the suspects are still on the property. If you would like additional information about Stealth Monitoring’s video surveillance service and how we can help deter and prevent criminal activity at your commercial property, contact us here.